Editor’s Note: The following is an article that I wrote in April of 2008. The publication of this article and the ensuing discussion of over 6,000 comments lead to learning more than I ever wanted to know about MonaVie. It’s lead to 2 legal threats from the company and a whole website of information at JuiceScam.com. If you are looking for the most comprehensive information on MonaVie and have a lot of time, that’s a good place to start. However, if you only have 10 minutes, the best information on MonaVie is at MonaVie Scam. Was my wife targeted to buy snake-oil? Hundreds of people weigh in. My wife is an active member in a nation-wide, young adults group. I am a member as well, but I’m not nearly as active (lack of time, plus my Laziness kicks in). The groups’ goals are very noble. They aim to help members with public speaking and event planning skills while raising money for charity through local businesses. Recently my wife went to a meeting and was gone longer than usual. I got a little concerned, so I called her to find out how the meeting was going. It turned out that it wasn’t a typical meeting any more – one of the members had invited some business acquaintances of his. When she got back, she told me about the meeting. It turned into a presentation of an energy/antioxidant juice called MonaVie. This juice is a blend of 19 juices with the most referenced being the acai­ (a-sigh-eee) berry. The acai berry supposedly has many, many antioxidant properties. I like to be as healthy as I possible, so why wouldn’t I incorporate MonaVie into my diet? The business behind the juice detracts from its value. The juice itself is not cheap. It’s $40 a bottle with a bottle lasting only around one week. That means you can expect to pay around $175 a month for this juice. For many people, that’s a significant car payment. For this kind of money, one would expect some sort of guarantee, perhaps a popular, publicly-traded, pharmaceutical company standing behind it. 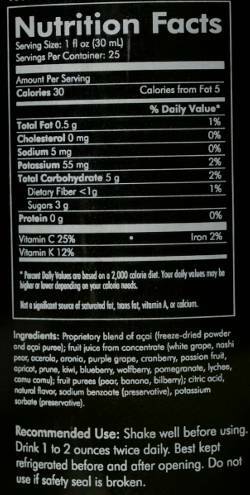 The company also doesn’t publish how much of the acai berry is each bottle. Beyond MonaVie juice being expensive, it is sold by distributors who are compensated in based on a multi-level marketing structure. Some of you familiar with Amway or Quixtar might understand how this works. For those who are new to multi-level marketing, the goal of the organization is to recruit more sellers and “incentivize” them for recruiting them. I’m not a big fan of such systems, it seems like the founders of the company always make a fair amount, and the people who join later end up with few sales and no one else to recruit. The people the other night were trying to coerce my wife to buy two bottles, at nearly $100, and potentially become a distributor. My wife balked at such a thing, largely because she knew that I would want to do some research before spending that kind of money. They ended up giving her two bottles of juice to try for free. I fear that my wife may notice a placebo effect and grow a taste for the expensive juice. MonaVie: Perhaps not a Scam? Is it possible that it could work? Well Wikipedia references that Red Sox players Jonathan Papelbon and J.D. Drew as fans. As Red Sox fans ourselves, this is high praise. I read an article from Fortune magazine that had high praise of MonaVie coming from Sumner Redstone. That’s a very influential person and a very influential magazine. I did find one scientific piece of research, a PDF by AIBMR Life Sciences (update: it seems to have been removed from the site). The clinical research shows that it does indeed deliver more antioxidants than a placebo (update: in the comments it has come out that the researcher of the study was supplying MonaVie with its acai – sounds very biased to me). However, it doesn’t compare to less costly solutions, like a multivitamin, V8 Fusion Acai Berry , or just a handful of mixed berries. I’m putting the burden of proof on MonaVie to show that their juice deserves the premium over the mixed berries. However, if you remain unconvinced, you can buy MonaVie on Ebay.